Keiko Fujimori has won first round of presidential elections in Peru scoring over 38 percent of the vote. 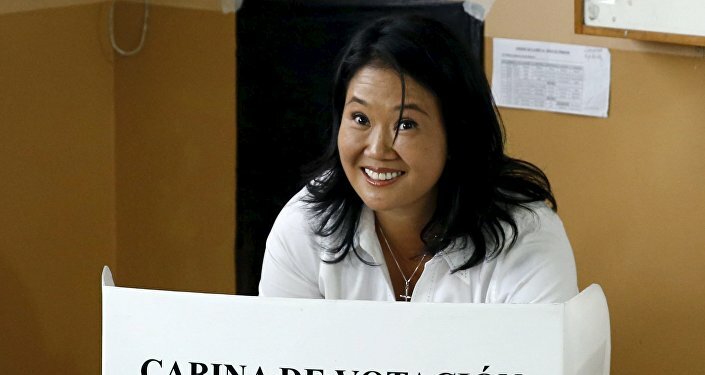 MEXICO (Sputnik) — Keiko Fujimori, daughter of former Peruvian President Alberto Fujimori, has won first round of presidential elections in Peru scoring over 38 percent of the vote, according to first official results revealed by Peru's National Electoral Processes Office (ONPE). Fujimori failed to gain the majority of the vote and will meet her centrist rival Pedro Kuczynski, who received some 25 percent, in the second round of elections on June 5.